We are still loving our simple life in California although our departure date at the end of August (after the Blackberry Festival) is rapidly approaching. We have been on some fun trips around California and up to Oregon in recent months, but have not been terribly inspired to blog. Partially because the editing process is not nearly as exciting on a day to day basis to write about, and because we thought that most people read our site during the tour to find out what was going on with Blind Pilot and perhaps were not as interested to now read about our new life in the woods. 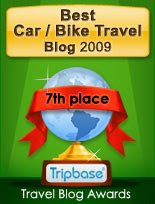 Then we received an email yesterday from Tripbase.com notifying us that we had placed 7th in their 2009 blog awards in the Car/Bike travel category. We thought it was interesting that they placed cars and bike travel in the same category, but didn't really mind because we were people in cars who followed people riding bicycles, so it kind of fits for us at least. They gave us a link to a nifty badge to put on our blog and said that this award is "a sign that you are in the top echelons of the blogosphere." Cool. Max calls it an "awardvertisement" for tripbase, but has allowed it to be displayed here. Emily thinks its sweet that someone noticed us. So thank you Tripbase for inspiring us to keep blogging. The focus might switch a bit more (as it has been in recent postings) to our life right now, as well as the film making process, instead of solely on the whereabouts and activities of Blind Pilot. Ryan said in his most recent post on their blog that he will try to be better with updates. As we begin to travel again, we will share our experiences in states we haven't driven through yet, as well as our attempts to screen the film on the road and to secure festival screenings and distribution. Emily did go to Eugene, OR last week to see her parents who were in town, catch a few delightful concerts at the Bach Festival and watch an amazing 15-5 win by the Eugene Emeralds. She got to visit with Ryan, Sarah and his parents as well. Ryan looked good, and it is quite amazing to hear his experiences with the music industry and how many people are now helping them do all the tasks that they had to self manage on bike tour - booking, merchandise, promotion, etc. He did bicycle back to Portland for some exercise and alone time and almost made it all the way. It's good to hear that bicycling and bike touring are still on their minds. We are appreciating the arid climate of this region in contrast to the high heat and humidity that Baltimore is famous for at this time of year, except that Emily's kitchen garden of herbs and pickling cucumbers are requiring more aggressive watering than her old garden. Luckily, our friend's mother's giant canning garden is growing like crazy and Emily has been helping with weeding and eating all of the beautiful fresh produce. We spent Friday, July 3 at Frontier Days in nearby Willits, CA - "California's oldest continuously run rodeo" - with our friends from the Bay Area and celebrated the 4th of July up at the Black Butte River Ranch's annual shindig in the mountains. Good food and good music always ensures a fun evening will be had by all, but the overwhelming hospitality of Tom and Margie, who run the place, really put this party over the top and reminded us of the truly special community we have found here.